A little shop window on a small side street in Shoreditch. If you walk into Hostem clothes shop, you'll also find this gem of a store through a door in the back. Bartender Paul Tvaroh of Lounge Bohemia loves the Italian liqueurs that range from super bitter to sweet chocolate, all of them made by monks. In addition to the liqueurs, they also sell scents, soaps, and candles. 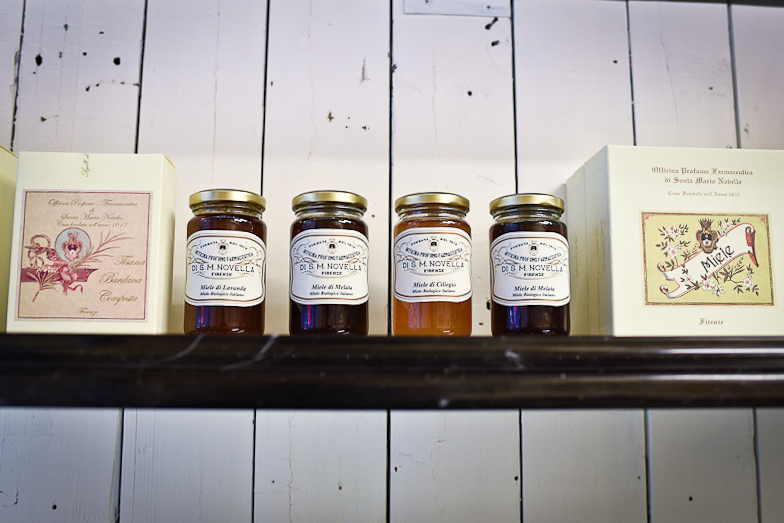 For the food-focused, they also offer a range of honeys. 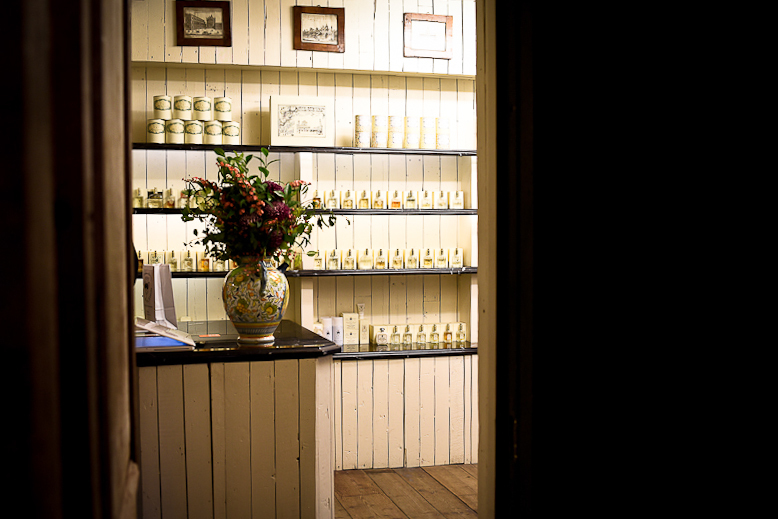 Tucked in the back of the fashionable Shoreditch clothing boutique Hostem is a jewel-box sized Florentine apothecary called Santa Maria Novella. The store-within-a-store sells products based on recipes from Dominican monks first made in 1221. The monks began selling the products in a church in Florence, Italy in 1612. Beautifully packaged boxes and bottles of creams, candles, chocolates, compotes, potions, perfumes, and herbal remedies line the shelves, but bartender Paul Tvorah, of Lounge Bohemia, recommends coming here for the liqueurs. There are nine different elixirs all with their own unique backstory and flavor. There is cappuccino; cioccolato; licorice; and chincona, which traces back to pre-Columbian Peru and has the bitterness of an amaro. Alkermes dates back to the 15th century and has a warm, spicy flavor. Mediceo was named in honor of the Medici family with ten different herbs, lemon balm and marjoram. Elisir di Edimburgo comes from a Dominican monk from a monastery in Edinburgh who visited Florence in the 17th century. Aside from the Shoreditch shop, Santa Maria Novella has stores around the world. In the United States, they have shops in Los Angeles, Miami, New York, Dallas and Washington, DC. 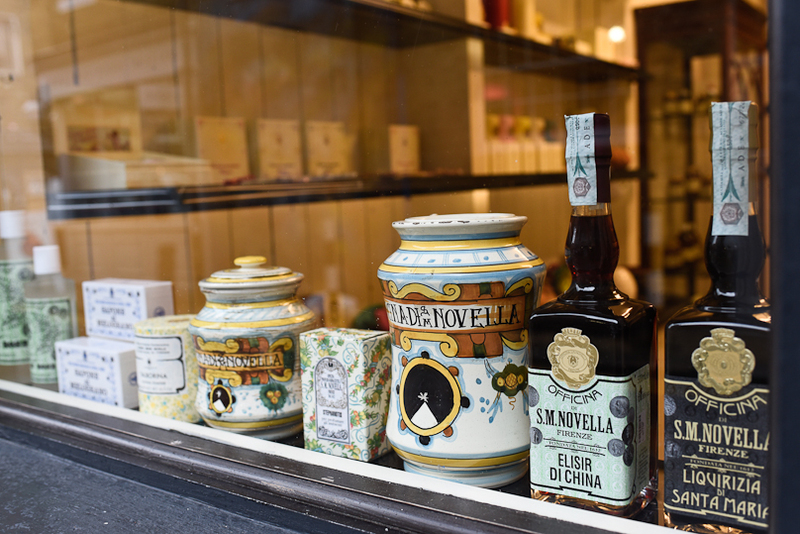 If you get the chance to visit their Florence boutique, it’s located around the corner of the Santa Maria Novella Church and you can visit their old laboratories, which is now a museum showing the history of how their products are made. From burgers to farm-to-table to a high-end experience, roving pop-up chefs James Sharman and Kevin McCrae love to frequent these London restaurants.